Famous Last Words is the second book I read by Jennifer Doktorski, the first being How My Summer Went Up in Flames, a road trip contemporary that I immensely enjoyed. I was very excited for Famous Last Words and overall it was enjoyable, however I felt it appeals to a younger age group in comparison to her previous book. 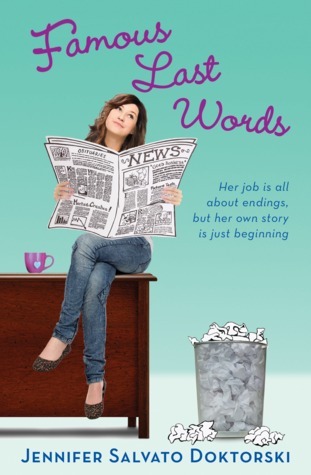 This book is all about Sam and her internship at the newspaper. Sam loves to write however she is stuck writing obituaries till the end of summer. We are introduced to AJ, another intern, but a college student. You can instantly sense that there will be a romance however do not expect much, it is not a major part of the book. This book centers more around Sam finding her passion as well as her independence from her friends and getting over the limits she usually sets for herself. I liked how dedicated she was and how she went after whatever she wanted. That is a great aspect in an aspiring journalist. What I didn't like is the way she treated her best friend.. and I know her best friend is a bit ditzy and somewhat shallow at times, she is still her friend and the way she always ignored her didn't bode well with me. There is a big story that Sam uncovers throughout the novel, however it isn't a personal one. Sam's life isn't messed up, she has two loving parents as well as a happy home life. You also get to see some banter from time to time between Sam and AJ but in the end, it is all about Sam's realization of what her true passion is as well as the direction she ends up taking in her educational life. Honestly, it wasn't a novel I was really invested in since I just didn't feel that there was much to invest in to. Overall, Famous Last Words was an enjoyable read, however don't expect too much depth from it. I really liked How My Summer Up In flames, so I wondered about this one too. Sounds pretty good. Great review. I didn't know this was by the same author! I agree, this does sound more like a middle grade book. I really like reading about friendships but it sounds like Sam almost takes her friend for granted. Thanks for sharing! LMBO!! She writes obituaries!!!?? That sounds depressing....but it does sound like a cute read for the summer! I might have to pick this up when it comes out. Thanks for the review Juhina! Haven't come across any books by this author, but I'm definitely intrigued now. Great review!